The changes that were announced today aren’t revolutionary, but if you like more features filling up the white space of Google, it’s got you covered. 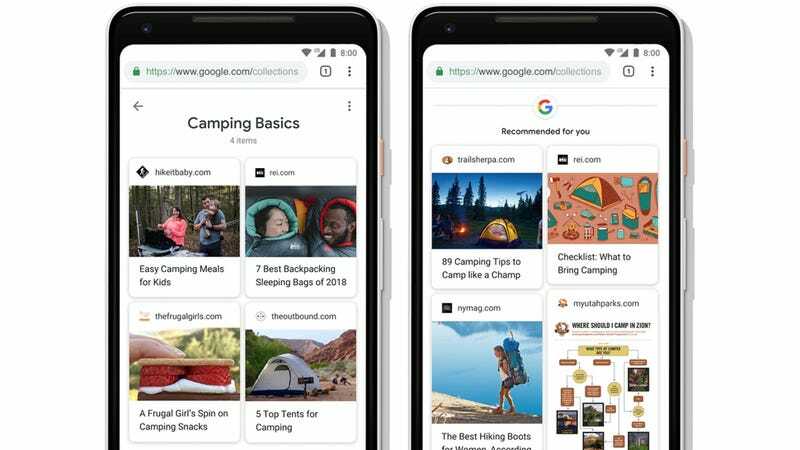 First of all, when you visit Google’s homepage on a mobile device, you’ll be seeing a new version of the Google feed that was introduced last year in the search app. Google’s calling this feature “Discover” now and it’ll surface content and relevant articles based on what Google knows about you. It’s all part of a rebranding push around taking users on a “Journey” rather than just providing answers. The search giant is also trying to get more visual and ripping off some features you’ve seen elsewhere. You’ll be encountering a lot more information cards and images. Activity cards will now appear at the top of search results that show your previous searches and activity when Google decides it would be “useful” to display that content. In case you don’t like being reminded of that search, you’ll be able to delete individual card entries. There will also soon be an option to save your own searches into “Collections” for future reference, and anytime a tech company puts the power in the user’s hand we should give due credit. Google’s also diving into the “Stories” game that Instagram and Snapchat have popularized. While the company says this feature is still in its early stages, you’ll be seeing more AMP stories in which a topic comes with curated text information, video, and images. Image search is getting an overhaul that will highlight more text content and include the quality of the page’s content in making ranking decisions and newer content will receive priority on the page. Additionally, Google Images is getting integration with Lens, the company’s tool that enables you to identify subjects that you take a photo of in the real world. Google’s also taking on LinkedIn with its new job search tool, “Pathways.” The feature was apparently built to provide users with relevant information about skills and locally available training alongside results for job listings. All-in-all, it seems like Google is doing what it can to keep you on its service a little longer before you inevitably click away. You can read more about some of the smaller changes that Google is making here.